Background: To date there is no firm conclusion as to the efficacy and safety of ibuprofen compared with indometacin for patent ductus arteriosus (PDA) closure in extremely premature infants. Objective: To conduct a randomised controlled trial to better address this problem. Methods: 119 infants (gestational age ⩽28 weeks) with respiratory distress syndrome and PDA confirmed by echocardiography were randomly assigned to receive either indometacin (0.2 mg/kg) or ibuprofen (10 mg/kg), starting at <24 hours of life, followed by half these first doses within 48 hours at 24-hour intervals if indicated by echocardiographic PDA flow pattern. Results: The PDA closure rate and the doses of drug (mean (SD)) were similar in both groups: 53/60 (88.3%) and 1.9 (1.5) mg/kg in infants given ibuprofen, and 52/59 (88.1%) and 1.9 (1.7) mg/kg in infants given indometacin. No significant difference was found in the numbers of infants requiring surgical ligation, and the levels of post-treatment serum creatinine and urea nitrogen between the two groups. Although not significantly different, more infants (9/59 (15.3%)) treated with indometacin tended to develop oliguria (<1 ml/kg/h) than those treated with ibuprofen (4/60 (6.7%)). There were no significant differences in side effects or complications between the two groups. Conclusions: Ibuprofen is as effective as indometacin for the early-targeted PDA treatment in extremely premature infants, without increasing the incidence of complications. When the echocardiographic PDA flow pattern was used as a guide for PDA treatment, fewer doses of drugs were needed to achieve acceptable closing rates. Patent ductus arteriosus (PDA) continues to be one of the most common problems in premature infants. Successful pharmacological closure of PDA with indometacin was first reported in 1976, and subsequent reports demonstrated that indometacin improved respiratory outcome and reduced morbidity.1–3 However, indometacin may lead to complications such as transient or permanent renal dysfunction,4 5 necrotising enterocolitis, gastrointestinal haemorrhage6 and reduced cerebral intracellular oxygenation.7 8 These indometacin-related complications have prompted many researchers to seek new, safer pharmacological closure for PDA. Previous animal studies have shown that ibuprofen induces ductal closure9 with fewer cerebral, renal and mesenteric effects,10 and influences regional circulation in a manner different from indometacin.11–13 Ibuprofen may also enhance cerebral blood-flow autoregulation, and has been shown to protect neurological function following oxidative stress in animal models.14 15 Earlier reports have proved that ibuprofen was effective for the closure of PDA,16–19 without reducing mesenteric, renal20 or cerebral21 blood flow. However, no firm conclusions as to the efficacy and safety of ibuprofen for PDA closure in extremely premature infants have been reached. Furthermore, previous studies did not include sufficient numbers of infants who were less than 28 weeks’ gestation to allow for reliable evaluation.19 22 Our study was performed to better examine these problems. The primary objective was to ascertain whether ibuprofen is effective and safe in inducing PDA closure in extremely premature infants. A secondary objective was to compare the complications between infants treated with ibuprofen and those given indometacin. This was a prospective randomised controlled trial conducted at the neonatal intensive care unit (NICU) of China Medical University Hospital in Taiwan. The study was approved by the Institutional Review Board of the Hospital. Before any subject was enrolled, an outline of the treatment was explained, and written informed consent was obtained from a parent. From February 2004 to October 2006, premature infants admitted to our NICU were eligible for the study if they met the following criteria: gestational age ⩽28 weeks, respiratory distress syndrome requiring assisted ventilation, a PDA without other cardiac anomalies confirmed by echocardiography within 24 hours after birth, no severe congenital anomalies or lethal cardiopulmonary conditions, and informed consent could be obtained from parents. The infants were studied using an Acouson 128XP/10 scanner with a 7 MHz colour and pulsed Doppler transducer. The first echocardiographic study confirmed cardiac normality and the ductus arteriosus was imaged from the high left parasternal view using colour Doppler echocardiography. Significant PDA was diagnosed when there was colour Doppler echocardiographic evidence of left to right ductal shunt. If PDA was present, the pulsed Doppler gate was placed in the pulmonary end of the ductus, taking care to ensure that the angle of insonation was below 20 degrees, and the flow pattern of the shunt was determined.23 24 Four PDA flow patterns can be identified: (a) pulmonary hypertension pattern; (b) growing pattern; (c) pulsatile pattern and (d) closing pattern (fig 1). We have reported that there is an association between pulsatile or growing patterns and the development of clinically significant PDA. Only a PDA with pulsatile or growing pattern will be treated, and daily echocardiographic PDA flow patterns determine whether the subsequent dose of medicine should be given. We have used this echocardiographic PDA flow pattern as a guide to early-targeted treatment for significant PDA in premature infants since 1997. Figure 1 Echocardiographic patent ductus arteriosus flow patterns. (A) pulmonary hypertension pattern; (B) growing pattern; (C) pulsatile pattern; (D) closing pattern; (E) closed pattern. Reproduced from Su et al,24 courtesy of the Archives of Disease in Childhood. All infants eligible for the study received echocardiographic assessment at an interval of once every 12–24 hours or as clinically necessary. If the PDA had a pulsatile or growing flow pattern, the patient was randomised to either the ibuprofen or the indometacin treatment group according to a random-number table sequence, which had been prepared by a study assistant who was not involved in the care of infants. The first dose of either indometacin or ibuprofen was given at the time the patient was randomised; if the PDA had flow patterns other than a growing or pulsatile pattern, no treatment was given. The subsequent doses of indometacin or ibuprofen were also determined according to the echocardiographic PDA flow patterns at intervals of once every 24 hours from the last dose. The dosage of indometacin (Indocid, Merck, West Point, Pa, USA) was 0.2 mg/kg (1 ml) as the initial dose and then 0.1 mg/kg in infants less than 48 hours old, 0.2 mg/kg in infants over 48 hours at 24-hour intervals as indicated by PDA flow pattern; dosage for ibuprofen (Arfen, Ibuprofen Lysine, Lisapharma, Erba, CO, Italy) was 10 mg/kg (1 ml) and then 5 mg/kg at 24-hour intervals as indicated by PDA flow pattern. The medication was intravenously infused continuously over 15 minutes. The drug was prepared and dispensed through the hospital pharmacy department and the attending doctors were unaware of the drug used. If PDA failed to close within 48 hours after one course (three doses) of treatment, the same drug was given with a similar treatment regimen, up to another three doses. 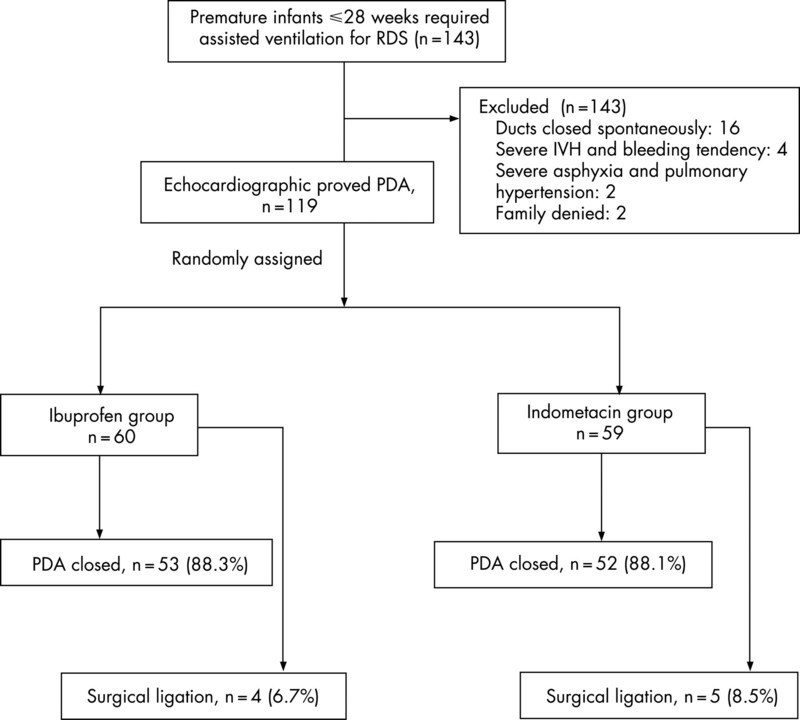 If PDA did not close after two courses of treatment or there were contraindications to the use of indometacin or ibuprofen, surgical ligation of PDA was considered according to the infant’s haemodynamic conditions. Contraindication included renal dysfunction (defined as oliguria <1 ml/kg/h during the previous 12 hours or creatinine >177 μmol/l), necrotising enterocolitis or gastrointestinal perforation, and bleeding tendency as shown by blood in the endotracheal aspirate, gastric aspirate, or stools and oozing from injection sites; or a platelet count less than 50×109/l. Intraventricular haemorrhage grading was done according to Papile’s classification,25 and intraventricular haemorrhage of grade 1–3 was not considered as a contraindication in our unit. Infants’ clinical data, total doses of indometacin or ibuprofen, PDA outcome, and the presence of complications associated with prematurity, as well as neonatal mortality were prospectively recorded. Complications associated with indometacin or ibuprofen occurring during treatment or within 48 hours of its completion, such as hypoglycaemia, impaired urine output, necrotising enterocolitis or isolated bowel perforation and gastrointestinal bleeding, were also recorded. Renal function was evaluated by daily assessment of urine output, serum creatinine concentration, and serum urea nitrogen before and after treatment. Oliguria was defined as a urine output of 1 ml/kg/h or less during a 24-hour collection period. Brain sonograms were performed in all infants before the treatment and at 3, 7, 14 and 28 postnatal days, or if clinically indicated for assessment of intraventricular haemorrhage and periventricular leucomalacia. Respiratory outcome was assessed on the basis of the number of days requiring mechanical ventilation and supplemental oxygen. Bronchopulmonary dysplasia was defined as oxygen dependence at 36 weeks’ postmenstrual age, in association with typical radiographic findings. The time required for the infant to regain birth weight and the time to full enteral feeding were also recorded. Sepsis, defined by positive blood culture, was also recorded. Based on our previous study, around 60% of extremely premature infants receiving mechanical ventilation experience successful PDA closure.26 As our primary objective was to detect a 25% difference in the PDA closure rate between the indometacin and ibuprofen groups, setting the α error <0.05 and β error <0.2 (two-tailed), with a power of 80%, we had to enrol 57 infants in each group. The χ2 test was used to analyse the categorical data, along with the Fisher exact test if appropriate. The Student t test was used for continuous data. SPSS for Windows, version 12.0 (SPSS, Chicago, Illinois, USA) was used for statistical analysis. A p value <0.05 was considered significant. One hundred and forty three extremely premature infants admitted to our NICU required assisted ventilation for respiratory distress syndrome during the study period. Of these, a total of 24 were excluded because their ducts closed spontaneously (n = 16), they had severe intraventricular haemorrhage (grade 4) and bleeding tendency (n = 4), severe asphyxia and pulmonary hypertension (n = 2) and two families did not consent. Therefore, 119 infants were randomly assigned to either the ibuprofen group (n = 60) or the indometacin group (n = 59) (fig 2). Table 1 shows the baseline characteristics of the infants. Figure 2 Distribution of study infants. IVH, intraventricular haemorrhage. The PDA closure rate was similar in the ibuprofen and indometacin groups, as was the number of doses of treatment (table 2). Reopening of the ductus after the initial closure was observed in nine infants receiving ibuprofen and eight receiving indometacin; however, the ducts closed after a further one to three doses of drugs. At the end of the pharmacological treatments, the total closure rates were 53/60 (88.3%) for the ibuprofen and 52/59 (88.1%) for the indometacin groups. The final number of infants who underwent ductal ligation for any reason was also similar in both groups: 4/60 (6.7%) infants receiving ibuprofen and 5/59 (8.5%) infants receiving indometacin (table 2). Minimal ductal shunting after treatment was observed in five infants (three ibuprofen infants and two indometacin infants) who did not require further respiratory support. No further drug was given, and the ductus closed spontaneously before discharge in those five patients. Survival at 1 month was similar in both groups. The most common causes of death were respiratory failure and overwhelming sepsis. There was no significant difference in the number of infants with severe premature complications between the two groups. The incidence of necrotising enterocolitis, localised bowel perforation and gastrointestinal bleeding was the same in both groups. The duration of respiratory support, the incidence of bronchopulmonary dysplasia, the time required to full enteral feeding and regain birth weight were also the same (table 3). Table 3 shows the renal outcome before and after pharmacological treatment of PDA. Although not significantly different, the number of infants who developed oliguria during the treatment was higher in the indometacin group (9/59 (15.3%)) than in the ibuprofen group (4/60 (6.7%)) (p = 0.13). Fluid intake was similar in both groups (data not shown). We found no significant difference in post-treatment serum creatinine and serum urea nitrogen concentration between the two groups. There was also no significant difference between pre- and post-treatment serum creatinine in either treatment group. Although post-treatment serum urea nitrogen was significantly higher than pretreatment serum urea nitrogen in each treatment group, it remained within the normal range. Ibuprofen is as effective as indometacin for patent ductus arteriosus (PDA) closure in larger premature infants. To date there is no firm conclusion as to the efficacy and safety of ibuprofen compared with indometacin for PDA closure in extremely premature infants. Our study confirms that ibuprofen is as effective as indometacin for early-targeted treatment of PDA in extremely premature infants. Using a 24-hour interval regimen for both drugs seems to be a safe and effective protocol. In a Cochrane review, there was no significant difference in the effectiveness of ibuprofen compared with indometacin for the primary outcome of PDA closure.27 Results for secondary outcomes are similar in the meta-analyses and our study. However, in our study the infants were treated at an earlier postnatal age and had a lower birth weight than in most of the previous studies. In the same review concerns were raised about an increased incidence of chronic lung disease at 28 days of age and a similar trend at 36 weeks postmenstrual age. In our study there was no significant difference at 36 weeks postmenstrual age. Van Overmeire et al studied the efficacy of indometacin and ibuprofen given to larger premature infants (⩽32 weeks) at the age of 2–4 days. They reported that the closure rate was similar (66% and 70%, respectively) after the first course and that there was no significant difference in side effects, although ibuprofen was associated with significantly less impairment of renal function.22 Another report in 2002 enrolled an even older group of premature infants (⩽34 weeks), who were treated from 48 to 72 hours of life. The efficacy after a first course was 69% and 73% for indometacin and ibuprofen, respectively.19 These two studies showed that infants of lower gestational age (<28 weeks) had a lower pharmacological closure rate and underwent surgical ligation more frequently, although there was no difference in effect between the drugs within each category of gestational age. Ibuprofen is as effective as indometacin for the early-targeted patent ductus arteriosus (PDA) treatment in extremely premature infants without increasing complications. Using our echocardiographic PDA flow pattern as a guide for PDA treatment, we used fewer doses of drugs to achieve an acceptable closing rate. Regarding prophylactic use, a large study of prophylactic indometacin in preterm infants showed that in infants with PDA, the risk of bbronchopulmonary dysplasia was similar in the indometacin and placebo groups; and in infants without PDA, the incidence of bbronchopulmonary dysplasia was higher after prophylactic indometacin.28 Also, a Cochrane systematic review showed that prophylactic ibuprofen reduces the incidence of PDA, the need for rescue treatment and surgical closure, but exposes a large proportion of infants unnecessarily to a drug that has important side effects (mainly affecting the kidneys) without conferring any important short-term benefits.29 A previous study concluded that early indometacin treatment (day 3) improves PDA closure but is associated with increased renal side effects and more severe complications and has no respiratory advantage over late treatment (day 7).30 Two previous studies reported on prophylactic ibuprofen versus placebo within 6 hours after birth in premature infants, and both concluded that there was a significantly lower frequency of PDA in the prophylactic group, but also associated with significantly decreased urine output during the first 1–3 days of life.31 32 The protocol we used was an early-targeted treatment for significant PDA guided by echocardiographic PDA flow pattern, not a prophylactic prevention of PDA. Our infants were treated as early as within the first 24 hours of life, and no increase was found in the incidences of renal side effects or other severe complications. Fewer doses of either ibuprofen or indometacin used in our infants may partly explain the lack of significant renal side effects. We also did not find a significant difference in the incidence of intraventricular haemorrhage or periventricular leucomalacia between the groups. However, the long-term neurodevelopment outcome of these infants treated with fewer doses of either drug will require further follow-up study. In our patients, although not significantly different, more infants treated with indometacin had a tendency to develop oliguria than infants treated with ibuprofen during the treatment period. Indometacin, a non-selective cyclo-oxygenase inhibitor, inhibits prostaglandin synthesis by inhibiting enzyme cyclo-oxygenase. This inhibition results in the constriction of the ductus33 and may cause a variety of adverse effects including renal dysfunction, necrotising enterocolitis, enteric perforation, gastrointestinal and diffuse bleeding. Of the two isoforms of cyclo-oxygenase (COX-1 and COX-2), COX-1 seems to be primarily involved in basal physiological processes in the kidney.34 Although both isoenzymes are inhibited by ibuprofen and indometacin, indometacin is more potent against COX-1.35 Based on the results of those studies and our observation, using a 24-hour interval regimen for indometacin seems to be a safe and effective protocol for PDA closure in extremely premature infants. Although ibuprofen was reported not to significantly reduce mesenteric blood flow velocity, in contrast to indometacin,20 this was not reflected in earlier full enteral feedings or in the rate of weight gain in our study. Finally, we have to acknowledge the limitation of the relatively small sample size in our study, which limited the power to detect possibly significant differences in the adverse events between the two drugs. Ibuprofen is as effective as indometacin for the early-targeted treatment of PDA in extremely premature infants without increasing incidence in renal dysfunction or other complications. A 24-hour interval regimen for both drugs seems to be a safe and effective protocol. Using our echocardiographic PDA flow pattern as a guide for PDA treatment, we used fewer doses of drugs to achieve an acceptable closing rate. We thank Dr Je-Jen Hu for his assistance with the statistical analysis.
. Pharmacological closure of patent ductus arteriosus in the premature infant. N Engl J Med 1976;295:526–9.
. Closure of the ductus arteriosus in premature infants by inhibition of prostaglandin synthesis. N Engl J Med 1976;295:530–3.
. Prophylactic indomethacin therapy for patent ductus arteriosus in very-low-birth-weight infants. N Engl J Med 1982;306:506–10.
. Indomethacin and its effects on renal function and urinary kallikrein excretion in premature infants with patent ductus arteriosus. 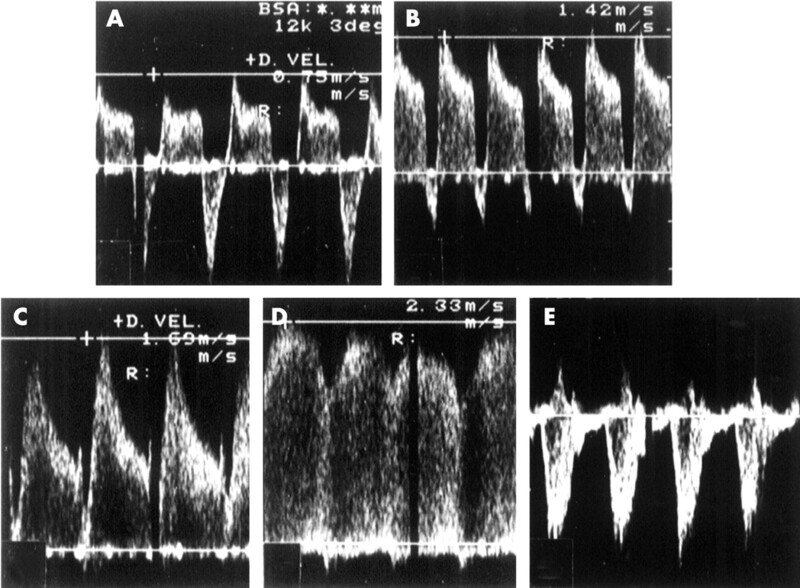 Pediatrics 1981;68:99–102.
. Indomethacin-induced changes in renal blood flow velocity waveform in premature infants investigated with color Doppler imaging. J Pediatr 1991;118:621–6.
. Early administration of indomethacin to preterm infants. Arch Dis Child 1986;61:233–8.
. Effects of indomethacin on cerebral haemodynamics in very preterm infants. Lancet 1990;335:1491–5.
. Effect of indomethacin on cerebral oxidized cytochrome oxidase in preterm infants. Pediatr Res 1993;33:603–8.
. Age-dependent changes in the response of the lamb ductus arteriosus to oxygen and ibuprofen. Can J Physiol Pharmacol 1979;57:825–31.
. Indomethacin compromises hemodynamics during positive-pressure ventilation, independently of prostanoids. J Appl Physiol 1993;74:1672–8.
. Differential effects of ibuprofen and indomethacin in the regional circulation of the dog. J Pharmacol Exp Ther 1981;219:679–84.
. Comparative effects of indomethacin, prostaglandin E1, and ibuprofen on bowel ischemia. J Pediatr Sur 1983;18:738–42.
. Effects of ibuprofen and indomethacin on regional circulation in newborn piglets. Biol Neonat 1999;76:242–52.
. Prostanoids determine the range of cerebral blood flow autoregulation of newborn piglets. Stroke 1990;21:777–84.
. Prevention of postasphyxial increase in lipid peroxides and retinal function deterioration in the newborn pig by inhibition of cyclooxygenase activity and free radical generation. Pediatr Res 1993;33:336–40.
. Ibuprofen treatment of patent ductus arteriosus. Lancet 1995;346:255.
. Early ibuprofen administration to prevent patent ductus arteriosus in premature newborn infants. JAMA 1996;275:539–44.
. Treatment of patent ductus arteriosus with ibuprofen. Arch Dis Child 1997;76:F179–84.
. Safety and efficacy of ibuprofen versus indomethacin in preterm infants treated for patent ductus arteriosus: a randomised controlled trial. Eur J Pediatr 2002;161:202–7.
. Effects of indomethacin and ibuprofen on mesenteric and renal blood flow in preterm infants with patent ductus arteriosus. J Pediatr 1999;135:733–8.
. Comparative evaluation of the effects of indomethacin and ibuprofen on cerebral perfusion and oxygenation in preterm infants with patent ductus arteriosus. J Pediatr 1997;131:549–54.
. A comparison of ibuprofen and indomethacin for closure of patent ductus arteriosus. N Engl J Med 2000;343:674–81.
. Echocardiographic assessment of ductus arteriosus shunt flow pattern in premature infants. Arch Dis Child 1997;77:F36–40. , Tsai Ch. Echocardiographic flow patterns of patent ductus arteriosus. A guide to indomethacin treatment in premature infants. Arch Dis Child 1999;81:F197–200.
. Incidence and evolution of subependymal and intraventricular hemorrhage: a study of infants with birth weights less than 1,500 gm. J Pediatr 1978;92:529–34.
. A survey on the treatment strategy of patent ductus arteriosus in very low birth weight infants. Acta Paediatr Sin 1998;39:33–7.
. Ibuprofen for the treatment of patent ductus arteriosus in preterm and/or low birth weight infants. Cochrane Database Syst Rev 2005;4:CD003481.
. Indomethacin prophylaxis, patent ductus arteriosus and the risk of bronchopulmonary dysplasia. J Pediatr 2006;148:730–4.
. Ibuprofen for the prevention of patent ductus arteriosus in preterm and/or low birth weight infants. Cochrane Database Syst Rev 2006;1:CD004213.
. Early versus late indomethacin treatment for patent ductus arteriosus in premature infants with respiratory distress syndrome. J Pediatr 2001;138:205–11.
. Prophylactic ibuprofen in premature infants: a multicentre, randomised, double-blind, placebo-controlled trial. Lancet 2004;364:1945–9.
. Prophylactic ibuprofen versus placebo in very premature infants: a randomised, double-blind, placebo-controlled trial. Lancet 2004;364:1939–44.
. Differences in the effects in the newborn piglet of various nonsteroidal antiinflammatory drugs on cerebral blood flow but not on cerebrovascular prostaglandins. Pediatr Res 1991;30:106–11.
. Biochemistry of prostaglandin endoperoxide H synthase-1 and synthase-2 and their differential susceptibility to nonsteroidal anti-inflammatory drugs. Semin Nephrol 1995;15:179–94.
. Mechanism of action of anti-inflammatory drugs. In: Sinzinger H, Samuelsson B, Vane JR, et al., eds. Advances in experimental medicine and biology. Vol 433. Recent advances in prostaglandin, thromboxane, and leukotriene research. New York: Plenum Press, 1997:131–8. Re: paper by Su et al. on ibuprofen vs indometacin for treatment of PDA (ADC 2008;93:F94-F99). There is an error in the first sentence of the results section in the abstract. In two places "mg/kg" should be omitted. Patient consent: Written informed consent from a parent was obtained.